Today, we’re truly excited at kulula.com, because Mzanzi’s most fun airline, will be celebrating its Schweet 16th Birthday. At 16 there’s no doubt that we are the coolest teen on South Africa’s airline strip and to get the party started we’d like to spread the love by giving away 160 000 Avios points, plus two car-hire vouchers from Europcar and Tempest to one wander-lusting kulula.com fan, every day for the next 16 days. 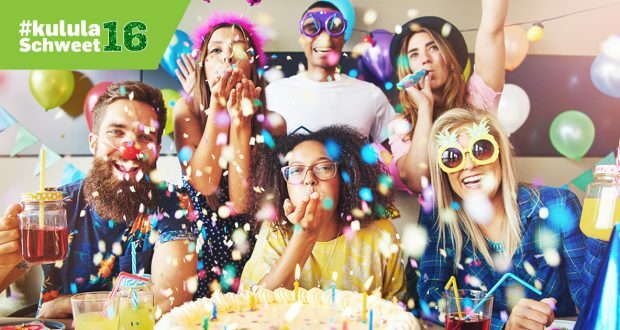 Just as our name suggests it will be super “easy” for fans to get their hands on the 160 000 Avios points, which converts into R9 500 worth of travelbank credit on kulula.com and together with some shiny wheels from our car partners they will be able to make their next trip to somewhere exotic a proper celebration. All South Africans are eligible to enter and doing so is simple. Just wish kulula.com a happy #kululaSchweet16 on Facebook, Twitter, Google+ or Instagram and sign up to our fanmail on the kulula.com site. A wish from one deserving fan each day, could be all it takes to win a share of the over 2.5 million up for grabs in Avios that will turn any South African’s wildest travel wish into a reality. “Just 16 years ago, kulula.com revolutionised air travel in South Africa by making flying much easier and more affordable for customers, and we’ve come a seriously long way since our first flight. Every now and again it’s good to look back to a time when you were the newcomer and appreciate how you’ve earned your stripes to be the leader in the South African low-cost airline sector. We’re proud of the how kulula.com has evolved and matured since pushing the boundaries and we intend to continue doing so, even if we’re now 16 and a bit more grown up,” says Shaun Pozyn, Head of Marketing, Customer Experience and Loyalty. “We encourage fans to celebrate with us, so don’t hold back on those #kululaSchweet16 wishes and if you’re not a fan then you should sign up for our fanmail on kulula.com.” The competition will run every weekday from Wednesday 16 August until Wednesday 6 September. Be sure to add the hashtag to your message to be eligible to win. Entries not completed in accordance with these terms and conditions will be ineligible. 1. The promoter of this competition is Comair Limited, Reg No 1967/006783/06, having its principal place of business at No 1 Marignane Drive, Bonaero Park, Kempton Park (the Promoter). Directors, employees and consultants of Comair Limited and their immediate families are not eligible to enter this competition. 2. The competition commences on the 16th August and ends on the 6th September 2017. The competition will comprise of 16 social media posts being run on weekdays. No late entries will be accepted. By entering this competition, you accept the rules of this competition and agree to the publishing of your name and entry on the kulula.com Facebook, Twitter, Google + & Instagram pages. Entrants will need to fully complete the sign-up process and verify their email address, or ensure details have been updated on the fanmail database. 3. For a qualified entrant to become a winner you need to have wished kulula.com Happy Birthday, be subscribed to kulula fanmail before the draw took place and have verified the fanmail subscription by emailing schweet16@kulula.com within 2 hours. Should no response be received within 2 hours of kulula notifying the qualifying entrant, they will be deemed to have forfeited their prize and the next entrant will be selected. 5. This competition is only open to legal residents of South Africa who are 18 years of age and older and who are South African citizens. The Promoter reserves the right to verify the validity of the entries & to disqualify any entry that is not received in accordance with these terms & conditions or where any fraud or cheating is suspected, including without limitation, the manipulation of code or the falsification of data. 6. This prize cannot be exchanged for cash. 7. One qualifying entrant will be drawn from the entries submitted on the kulula.com Facebook, Twitter, Google + & Instagram page on each of the 16 days. The qualifying entrant will be notified via the relevant kulula.com social media channel. 8. The Promoter will publish the name of the winner on the kulula.com social media channels on each of the 16 days. 9. This promotion is in no way sponsored, endorsed, administered by, or associated with, Facebook, Twitter, Google + or Instagram. 10. The conducting of this competition will be over seen by an independent auditor. 11. Competition winners are limited to winning 1 of the 16 draws, which will be verified by means of requesting a valid ID as verification. 12. Avios points can take up to 30 days to be awarded from the competition closing date of the 6th of September 2017. 13. kulula.com reserves the right to amend when and how the winners are announced. 14. The promoter retains the right to substitute any prize with another prize of similar value in the event the original prize offered is not available.